Caffeine is the most used drug in the world. For this reason caffeine, one of the most active ingredients in coffee has been studied extensively to help us understand how it affects our bodies. Caffeine can be found in a variety of sources, such as tea, cocoa, and cola drinks. Human beings love their caffeine. In fact, caffeine is the most used drug in the world. For this reason, caffeine, one of the most active ingredients in coffee drinks, has been studied extensively to help us understand how it affects our bodies. Caffeine can also be found in a variety of sources such as tea, cocoa, and cola drinks. 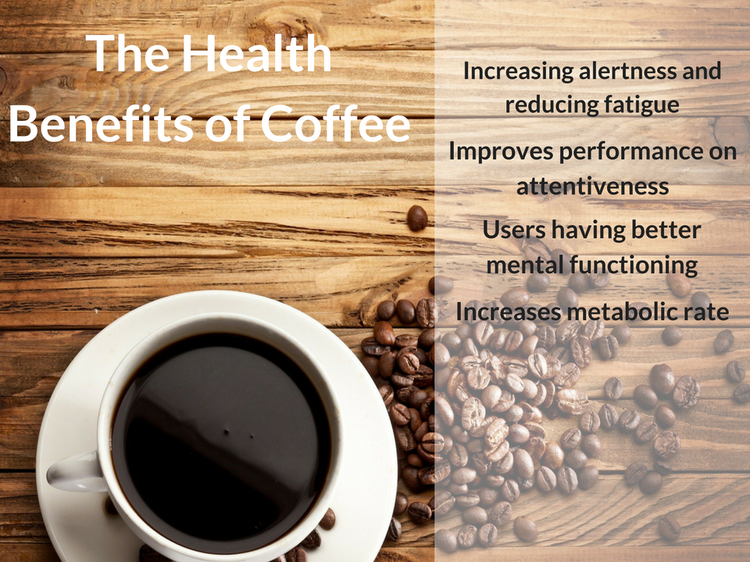 For many individuals, coffee can one help stay awake and alert throughout the day. Caffeine is a stimulant that competes for the same protein spaces as a sleep-promoting chemical, known as adenosine. Caffeine also stimulates the heart and smooth muscles, increases stomach secretions, and promotes urination. Caffeine side effects include increasing alertness and reducing fatigue, which may be significant in low arousal situations (e.g. late night work shifts). One of the benefits of caffeine is that it improves performance on attentiveness tasks and simple tasks that require a sustained response. These effects are often clearest with reduced alertness, although there is evidence that benefits may still occur when the person is unaffected. The effects on more challenging tasks are difficult to assess and most likely dependent on interactions between caffeine and other variables that increase alertness (e.g. personality and time of day). Most individuals are experienced at controlling their caffeine consumption to maximize the above positive effects. It may be addictive and dependence can occur. Other short-term side effects include headache, nausea, and anxiety. Short-term overdose of caffeine is usually an excess of approximately 300 milligrams depending on body weight and level of caffeine tolerance. An overdose can result in a state of central nervous system over-stimulation, called caffeine intoxication or "caffeine jitters". The American Academy of Pediatrics recommends that adolescents consume less than 100 milligrams of caffeine a day. Younger children should not drink any caffeinated beverages on a regular basis. Frary, C. D., Johnson, R. K., & Wang, M. Q. (2005). Food sources and intakes of caffeine in the diets of persons in the United States. Journal of the American Dietetic Association, 105(1), 110-113.